It has long been known that good breathing is one of the pillars of health and well-being. We know that if someone feels stressed-out and anxious, their breathing is usually fast and shallow. In such a situation the normal reaction would be to advise the person to take a deep breath and then to exhale slowly. And that’s it: the sometimes-forgotten-but-thankfully-not-completely lost art of breathing! It is no surprise that breathing is an essential part of most bodyworks and body therapies, most notably yoga, Tai Chi and Pilates, but it’s clear that in many other disciplines and sports coaches and students alike understand the importance of breathing and use it to enhance experience and performance. Breathing lies at the centre of each action, and it can be a vital tool during birth. Though everything you feel and experience will influence your breath, knowing how to breathe well can help you to stay calm, to let go when you need to and can enable a positive birthing experience. Breathing is part of life support, and mothers can use effective breathing to help their babies feel good during the birth. Once you become aware of how you can improve the quality of your breathing, you will have knowledge of a technique that you can use for the rest of your life. By breathing life into every part of your body, you will feel refreshed and energised, yet still calm and relaxed. What’s not to like? Start off by observing your own breathing for a moment. Just feel it and notice where it’s going to (just into your lungs, or deeper down into the abdomen? ), how long each part of the breath is, if it feels obstructed or if it is flowing freely. If you’re under a lot of pressure, your breathing may become shallow and restricted, perhaps to the point where you no longer know how to release it. If you’re out of breath, breathing with short breaths, or doing a lot of sighing, it’s time to reconnect with your body and your breath. Become aware of your breath, and finally let it go. You can do this simple observation by yourself or with a partner. Take a seat and make yourself comfortable. 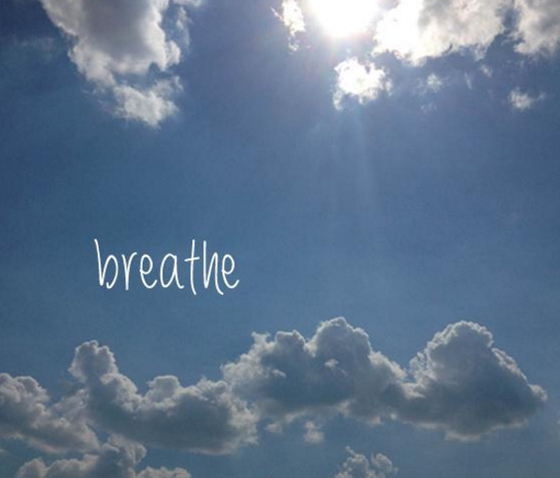 Allow your usual breathing to establish itself and then spend some time simply observing it. Don’t try to change anything about it, just take notice of it. Where to? Where can you feel the movement of your breath most? Is it more in your chest, or more in your abdomen? More at the front of your body or at the back? Where from? As everything has an origin, try to identify where you think your breath originates. Pace: Is your breathing slow or fast? How many times do you breathe in in one minute? Rhythm: What sort of pattern does your breathing have? Are all parts of your breath equal? Is the in-breath longer or shorter than the out-breath? Do you pause at any part of the cycle? Texture: Are your breaths deep and resonant? Free-flowing or obstructed in some way? Are they consistent, or has anything about them changed during the period of observation? Now relax and cease the observation. Once you are able to connect with your own breathing in this way, breathing for the birth will be much easier. It helps you to be in control, to relax, and to progress smoothly through the process of birth. The following exercises build on this observation, developing control over your breathing, and ultimately over your whole body. Breathe in and out calmly, imagining that you are inhaling positive energy through your nose. Imagine this positive energy flowing smoothly down the front of your body. This positive energy is filling your chest, arms, your belly, your legs . . .
. . . down, down, right to the tips of your toes. As you exhale, the positive energy flows all the way up the back of your body. You can feel it moving gently up from your heels, up the back of your thighs, your buttocks, all the way up your back to the top of your head, until your head is filled with positive energy. Now gently inhale and repeat the process. Use this technique any time you want to get yourself into good state of relaxation. It’s important to know how to stop a spiral of negative thoughts, and with this method you can open the gate to your subconscious. Did you know that you can actually chat to your subconscious and introduce some positive thoughts into it? Here is another exercise, of a slightly more energetic nature. Opt for this one if you’re up for making some noise! Roll your tongue at the tip, or just purse your lips as if you were going to kiss someone. Now, like a Maori warrior, move forward or bend your knees, open your eyes wide, stick your tongue out as far as it will go, and make a roaring sound: aaaaaaahhhhhhhggggggrrrrrrrrrr – you are a lion! Keep doing this a few times and notice how relaxed your jaws become. This exercise is great for relaxing the face and jaw, and as these are connected to the pelvic floor, you will be relaxing the pelvic floor also. When you sing, you breathe more deeply, and if your body is flooded with oxygen, it finds it easier to relax and let go. Here is another exercise, this time from my singing practice: place your hands on your hips and exhale while saying ‘Shuft, shuft, shuft, shuuufffttt . . . YEAH!’ Now inhale, and with each exhalation make a long sound while you relax your jaws, tuning in to what feels best for you right now. On days when you are feeling vulnerable, or if you just enjoy doing these kinds of exercises anyway, you can stand, sit, or kneel and imagine that with each inhalation you are inhaling light, harmony, and good feelings. When you exhale, make a sound — a hum, short or long, soft, or growing volume like a wave, or a smooth monotone —and as you do so imagine that you are building a protective structure around yourself layer by layer: a bell or an igloo of sound, to protect you and make you feel good.